[WILLIAMS JENNING BRYAN]. “The Issue--1900: Liberty, Justice, Humanity.” Columbus, Ohio, Neville Williams, 1900. Chromolithograph, printed by the Strobridge Lithograph Company, Cincinnati, Ohio. 20 x 30 in; edges slightly trimmed, very faint mat toning; laid down on canvas. 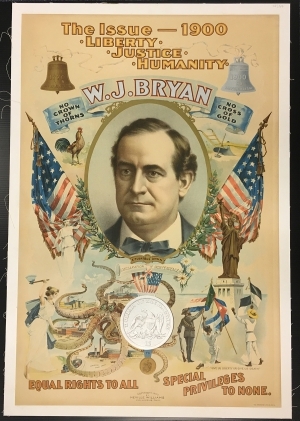 William Jennings Bryan (1860-1925) of Nebraska was a powerful orator and prominent populist who failed in bids for the presidency in 1896, 1900, and 1908. His support for farmers and laborers led him to oppose trusts and seek monetary, trade, tariff, and railroad rate regulation. After his third presidential bid, he became Woodrow Wilson’s Secretary of State in 1913. A pacifist, in 1915 Bryan resigned after Wilson began to move towards fighting Germany in WWI after the sinking of the Lusitania. Bryan supported Prohibition and was an ardent anti-Darwinist. He died in 1925 five days after the conclusion of the Scopes Monkey Trial, where he defended Tennessee’s anti-evolutionary position.